Does the loose skin on your eyes bother you? Do you want to remove wrinkles & tighten your skin with longer lasting results using a non-surgical procedure at a less prohibitive cost? This state of the art treatment is the solution for you! Using German technology, which has been extremely popular in Italy and Greece for the past few years, is now available in Australia! Based on state-of-the-art plasma technology, it is now possible to eliminate slackened skin and so-called wrinkles without surgery! This is a fantastic solution for clients who do not want to go under the knife and are looking for a different solution. There is no general anaesthetic, no cutting or stitching, and very little down time. Results can be seen immediately and continue to improve over 2-3 months. This treatment uses a new ‘plasma technology’. It works by using a tiny plasma flash to stimulate an instant contraction and tightening of the skin fibres. The elasticity of the skin is improved and tightening is made possible. There is no damage to the skin, no open wounds and healing time is low. See results after 1 treatment! One treatment is often enough depending on skin type, severity of wrinkles and client’s expectation. On occasion 2/3 treatments may be required to achieve the desired outcome, follow up treatments can be carried out after 8-12 weeks at a discounted price. All areas of the face and body can be treated such as frown lines, marionette lines, upper lip lines, neck wrinkles. If a 2nd treatment is required the cost of this will be determined by the practitioner, taking into consideration the amount of work that is required, but will generally be around 50% of the original treatment cost. Deeper lines or very heavy eyelids could possibly need 2-3 treatments. The second/third treatment is ideally carried out 2-3 months after the initial one as the results from the first treatment continue to improve during this period. Upper eyelid lift: $850-$995 NOW $425!! 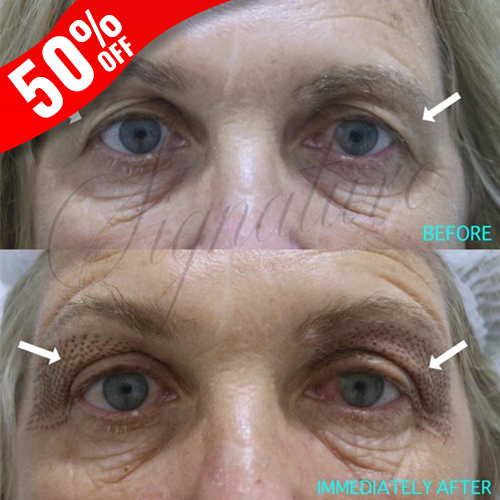 Lower eyelid wrinkle treatment: $850 – $995 NOW $425!! Crows feet (side of eyes) $420 NOW $210!! Top lip (smokers’ lines) $450 NOW $225!! Bottom Lip area from $350 NOW $175!! Cheeks from $850-$995 NOW $420!! 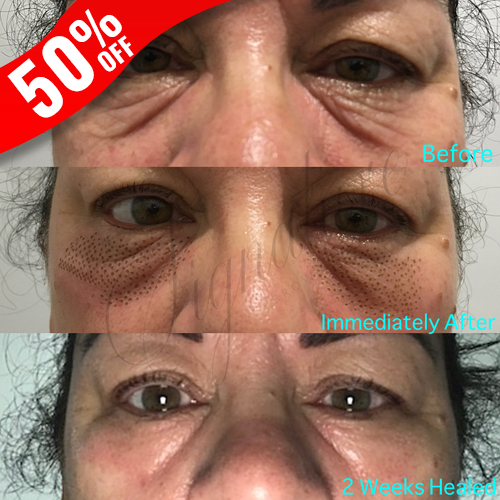 Nasolabial Folds $450-$550 NOW $225!! Frown lines (between brows) from $275 NOW $137.50!! Forehead Lines (horizontal lines) $450 – $550 NOW $275!! Marionette Lines from $450-$550 NOW $225!! If you would like multiple areas treated a discount may be applied. *Please note: Upper & Lower Eye areas cannot be treated in one session due to swelling. With Zip Pay options available you can pay off your treatment up to $1000 without any interest. We are offering HALF PRICE on ALL Non-Surgical Eyelift & Skin Tightening treatments. (That’s a massive saving of up to $500) !!! Book in for a complimentary consultation.